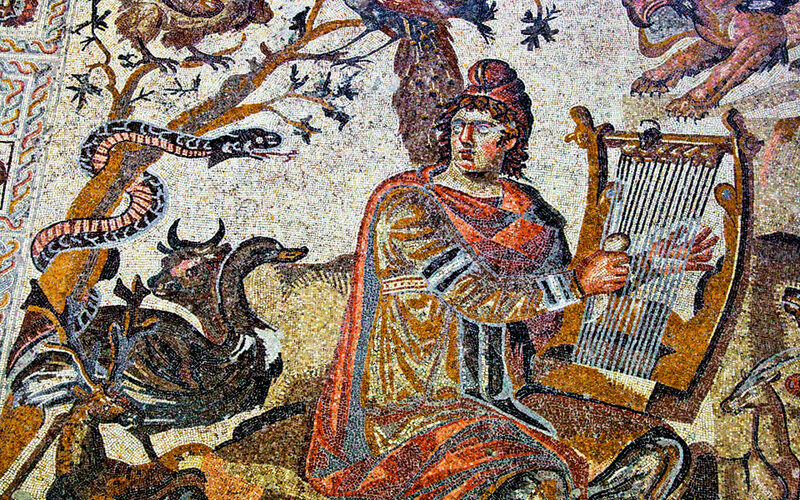 Orpheus enchanting animals, birds and reptiles with his music; mosaic, 4th c. AD (Shahba Museum, Syria). Shedding light on the roots of sound as a healing agent for body and soul. According to Damon, a music theorist of the 5th c. BC and teacher of Socrates and Pericles, music is powerful because it imitates the movements of the soul. Music, in the ancient Greek understanding, has two faces. On the one hand, it can suppress human passions and desires, making it a powerful moral and educational tool. On the other hand, it can influence the “animal” part of the soul when that is disturbed, and act as a calming, therapeutic influence. 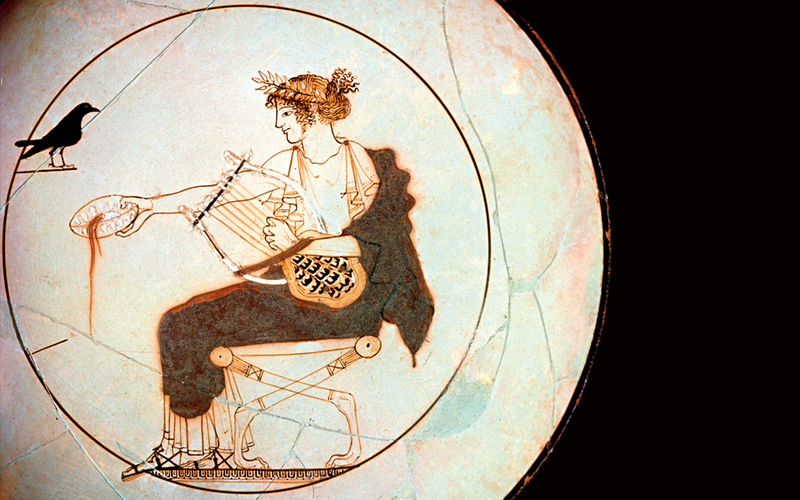 Accordingly, the Greeks of the Classical period attributed the gift of music both to Apollo, for its educational value, and to Dionysus, for its cathartic and therapeutic power. It is this second aspect of music that we will focus on here. 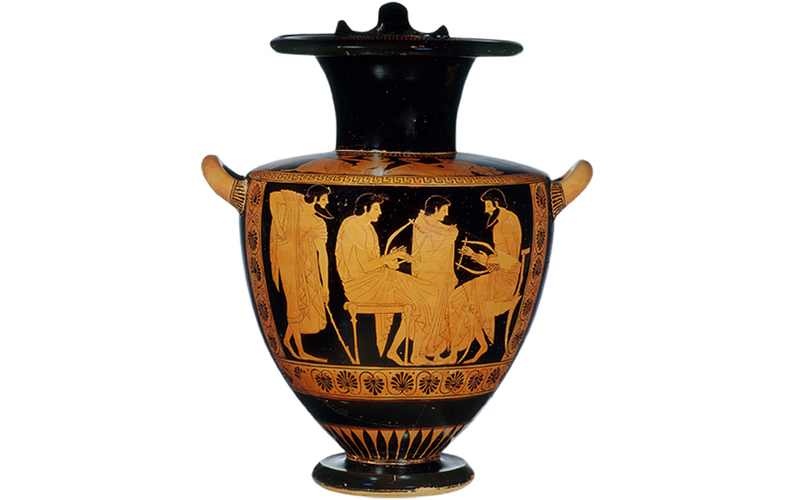 A music lesson; Attic red-figure hydria painted by Phintias, 510 BC (State Collection of Antiquities, Munich). In the case of ritual mania, a specific instrument and a particular musical mode are prescribed as the only ways to manage passion and achieve catharsis: the sound of a flute playing Phrygian music. The Phrygian sound was seen as best-suited to the sonic range of the flute, and was perceived to have “orgiastic” qualities which excite the senses. According to Aristotle, the flute, as well as certain sacred songs, awaken passions such as pity, fear and enthusiasm. In those who are susceptible to such passions, flute music and sacred melodies can heal the soul and bring catharsis mixed with pleasure. For this reason, Aristotle proclaims, this type of music is suitable for the theater. The idea that certain types of melodies and sounds have a purgative effect on disturbed souls is also expounded by Plato. In his work Ion, he describes how Corybants (ecstatic revelers “who when they dance are not in their right mind”) can only perceive one kind of music: that of the god who possesses them. In order to harmonize with it, they reflexively dance to its rhythm and sing the words that go with it. This is where we begin to see the notion of music – and dance – as a means of diagnosis and therapy. The therapeutic role of music was also important to the followers of the Orphic cult and the Pythagorean philosophers. The Pythagoreans shared with the Orphists the belief that life is a punishment for previous sins. For them, music was a technique which, combined with an ascetic lifestyle, aids the therapeutic catharsis of the soul. The Orphists and the Pythagoreans used two main types of purifying choral songs: paeans and epodes. The use of therapeutic paeans is already evident in Homer’s epics. In the first book of the Iliad, it was the day-long performance of hymns and paeans that saved the Greeks from the plague inflicted by the arrows of Apollo. Similarly, it was the peaeans sung by the lyric poet Thaletas in Sparta that were credited with ridding the city of plague. The Pythagoreans employed a daily routine of music therapy. Music enjoyed prior to retiring at the end of the day helped them to calm down and gave them a good night’s sleep with pleasant dreams. Immediately on waking, they performed special compositions on the lyre, which helped them to shake off the reveries from the night before and prepare for the intense rhythms of the day. It seems that the Pythagoreans had studied the relationship between musical rhythm and temperament, and applied musical “prescriptions” according to the circumstances. Apollo is shown offering a libation; Attic white-ground kylix, 480-470 BC (Archaeological Museum of Delphi). Epodes, the second type of curative songs, were more like magical spells. The therapeutic use of epodes is mentioned in the Odyssey, when the sons of Autolycus cure Odysseus’ wound with the use of a compress and a spell-song. Spells found many uses; in addition to being used as medical cures, they healed heartbreak, tamed the forces of nature and dispelled demonic elements. The mythical figure of the sorcerer, bard and prophet Orpheus is the embodiment of the power of music, and specifically of the potency of the epode. Orpheus himself was able to move all types of objects just with epodes, from a lit torch to the ship Argo. We can see very striking analogies between modern music or drama therapy and Dionysiac rituals or even the carnival. Today, the myths and beliefs of the ancient world about the therapeutic powers of music find their place in the science of music therapy, be it the practice of interactive music therapy or the use of music medicine as a complement to conventional medical treatment. Music is prescribed for adults and newborns suffering from anxiety, pain and sleep disorders, as therapy on intensive care wards and for a variety of other clinical uses. Modern practitioners of music therapy are trained in methods that can be traced directly to the Apollonian and Dionysiac approaches, as conveyed through Platonic theory. It also appears that the ancient Greeks had grasped through empirical observation what we now can see through the use of PET scans and functional MRI; namely that music learning aids in the development of other skills aside from purely musical ability. Children who play in orchestras or sing in choirs learn how to work alongside other children and develop their communication skills. The ancient Greeks realised that musical education enhanced mental ability and produced better-educated and skilled citizens. It is no accident that they rated music not only as a curative tool, but as part of their core education.